During the last quarter of 2012, Susan completed the subject and chronological files of Executive Vice President (EVP) Sanford Solender. Mr. Sanford Solender was EVP of the Federation of Jewish Philanthropies of New York from 1970-1981. This quarter, Eric has completed processing the chronological file of Stephen D. Solender. Mr. Stephen Solender was the EVP of the UJA-Federation of Jewish Philanthropies of New York from 1986-1999. From 1986-1989, he shared the position of EVP with Ernest W. Michel, during the Federation’s merger with United Jewish Appeal of New York and the subsequent transition, and continued as Executive Vice President for another ten years. The Solender family has a long history of work in Jewish social services. The Solender Family Papers (P-554), a separate, small collection that already exists at the American Jewish Historical Society, document in part the service of Samuel Solomon Solender (grandfather), Sanford Solender (father), and Stephen Solender (son) at various Jewish philanthropic or social service institutions in Ohio, Maryland, and New York. Now, with Eric’s completion of a portion of Stephen Solender’s files as EVP, we are taking the opportunity to discuss some of our observations regarding the chronological (and subject) files of both Solenders during their respective tenures as Executive Vice Presidents. Susan: One challenge of the Sanford Solender (SS) files was the fact that SS integrated his short-lived predecessor David Salten’s files into his own. 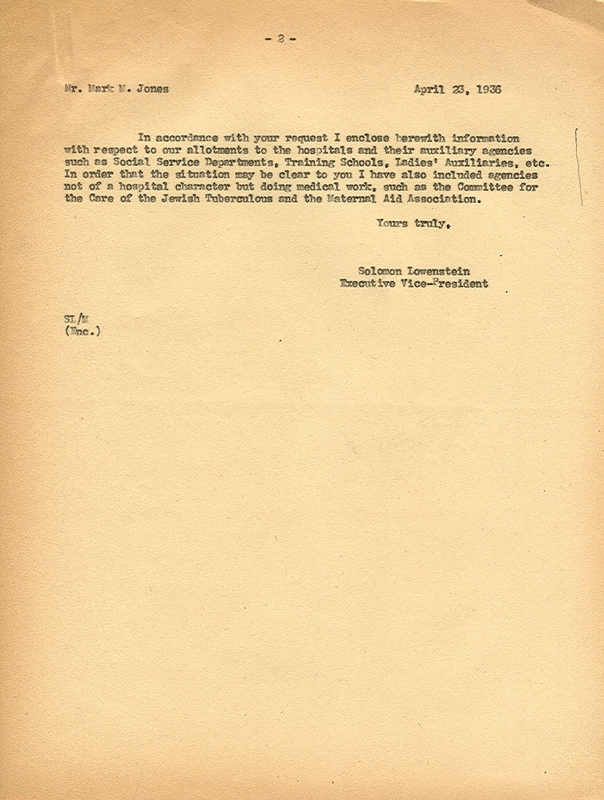 Because Salten was EVP for just 2 years (which was a very brief stint in the history of Federation EVPs – Salten’s predecessors Maurice Hexter and Joseph Willen jointly held the position for 25 years) his surviving subject files consist of just a few pages in scattered folders in which the bulk of the contents consisted of SS files. If we were processing at a slower rate we might have separated Salten’s files from Solender’s to create his own small subseries as EVP. But the goal of this project is to create access to the entire collection within 4 years which we can accomplish only if we process minimally, and prioritize access over arrangement and description. Researchers interested in Salten’s files will be able to find them based on the folder dates – a beginning date of 1967-1969 will in most cases bring Salten’s files to light. At the other end of SS’s tenure was William Kahn, who completes the Salten-Solender-Kahn sandwich that makes up the Sanford Solender subseries. Many of SS’s files end with a few additions of Kahn’s, traceable by the ending date range. The bulk of Kahn’s files exist within his own subseries, as he generated a substantial number of files in his 6 years as EVP (1981-1987). For a delightful description of Sanford Solender as a Federation leader, please listen to the oral history of Reynold Levy or read the transcript beginning on page 40. The volume of the chronological files is what initially struck me about the files and continued to amaze me as I processed the material. The archivally-processed files fill approximately 32 Banker’s boxes (linear feet of shelf space) and, with several gaps in the dates, range from 1986-1998. 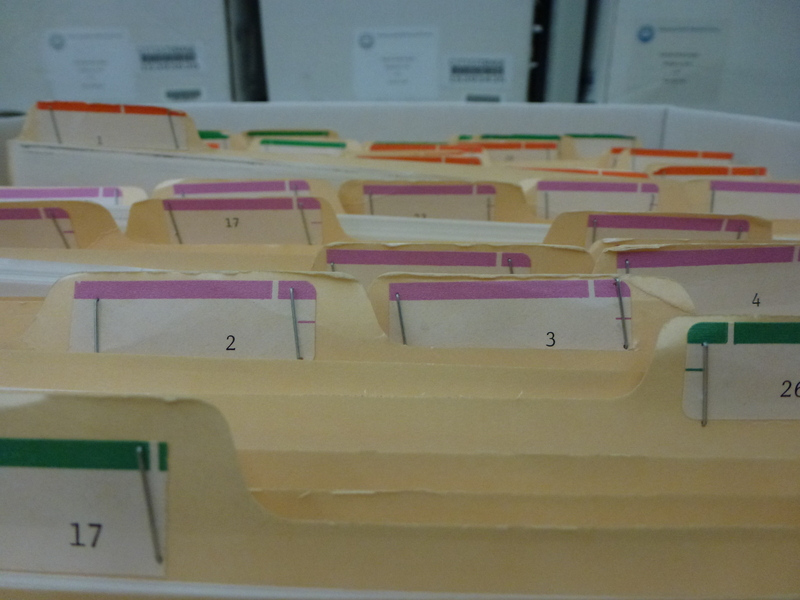 From roughly 1986-1990, the chronological files are arranged by month, with some months requiring multiple folders; these four years fill about five boxes. However, in 1991, where the amazingly huge volume of the files seems to start, the chronological files begin to fill folders on a daily basis. With the folders dated from 1991-1998, the archival material is arranged by month and day. Mr. Solender was receiving and sending enough correspondence daily that each day (or most days) of a month has its own folder! To compare with the files of his father, Sanford Solender’s chronological files fill up about 3.5 Banker’s boxes, not including his time as a consultant. His chronological files range from May 1974 through September 1980 and most folders cover an entire month. The difference between the two sets of chronological files does not seem to be a difference of kind, but a difference in volume. The subject matter within the Stephen Solender chronological files does not seem to differ significantly from that of other Executive Vice Presidents. There are the same kinds of correspondence we might expect—thanks, condolences, acknowledgements, solicitations, coordination with affiliated and non-affiliated institutions, appeals, recognition of donors, and praise of various employees. Although, the subject matter remained the same, the volume of correspondence sent and received by an Executive Vice President seems to have exponentially increased between the tenure of Sanford Solender and Stephen Solender. Predictively speaking, it may be a fair assessment to assume that, ceteris paribus, Executive Vice Presidents that sequentially follow Mr. Stephen Solender will have even larger sets of chronological files that account for their daily activities as chief executive of UJA-Federation of Jewish Philanthropies of New York, either in paper or electronic form. Our previous blog on functional groups focused on functional group changes up until the early 1970s. This blog post will focus on the changes to the functional groups in the 1980s. Special Grants and Other Allocations. A new functional group called Community Relations was created as a result of the creation of a subcommittee to the Distribution Committee of the same name. The chairman of this subcommittee was Kenneth Bialkin, currently a member of the AJHS Board of Trustees. This functional group dealt with all aspects of communal relations including community councils and communal planning. Examples of major agencies under Community Relations include the Jewish Community Relations Council (JCRC) of New York, National Jewish Community Relations Advisory Council (NJCRAC), and the National Conference for Soviet Jewry (NCSJ). JCRC and NCSJ were examples of organizations that were initially special grants and subsequently became a part of the Community Relations functional group. Other examples of agencies falling under this category are the Jewish Community Councils, of which there were about 20 agencies in the New York City area. 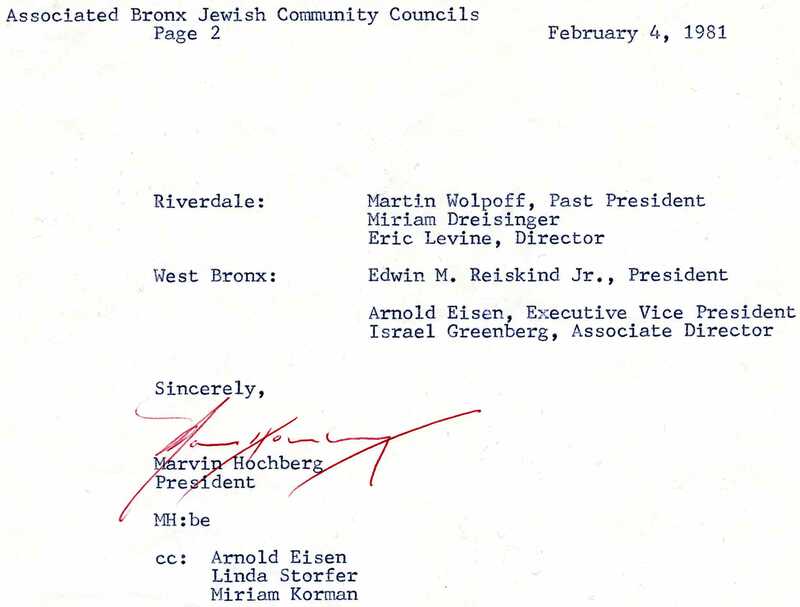 The letter pictured below was from Marvin Hochberg, President of the Associated Bronx Jewish Community Councils, to Mr. Bialkin. 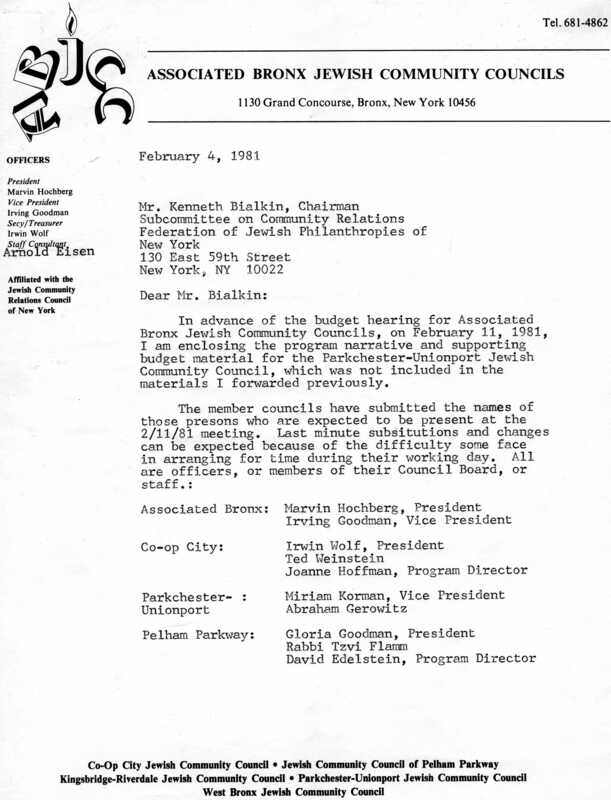 The new scheme was used in arranging the annual agency budget files from the 1981-1982 fiscal year (FJP files) through Federation’s merger with UJA in 1987, and at least through the files for UJA-Federation’s 1988-1989 budget year, currently in-house and undergoing processing. Solomon Lowenstein was Executive Director of the Federation for the Support of Jewish Philanthropic Societies of New York City from 1920 to 1935, when his title changed to Executive Vice-President. He remained in this position until his death in 1942. Over a year ago we processed what we thought were the only surviving files from Solomon Lowenstein’s office; they contained about a box and a half of his agency files, through the 1930s and 1930s. They had been boxed up and sent to storage originally with Maurice Hexter’s files, with Dr. Hexter retaining the files for his own correspondence for about another 5 years. We have just located another box of Lowenstein’s correspondence packed with miscellaneous early Budget Department files; there was no identification at the box level as to the existence in this box of Lowenstein files, so it was a very happy surprise. The box contains General Correspondence files from 1936-1940. The topics range from New York State Unemployment insurance guidelines to correspondence with staff from the Julius Rosenwald Fund, to communications with Samuel Levy, Manhattan Borough President. 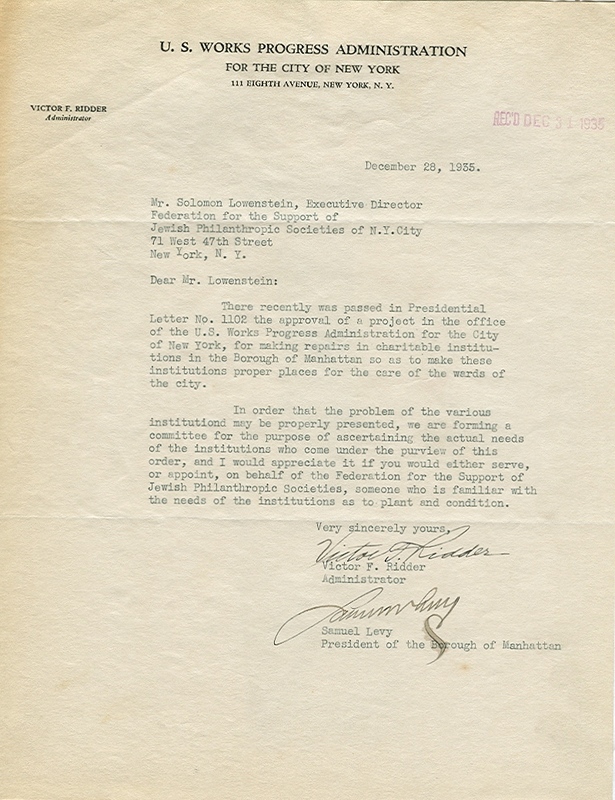 Lowenstein’s correspondence with Samuel Levy focused on details of Works Progress Administration (WPA) funds that were channeled through the New York City Department of Buildings to about 30 Federation agencies with facilities in Manhattan, for long-overdue building maintenance. As stated in the letter from Mr. Levy, the funds were to be used “for making repairs in charitable institutions in the Borough of Manhattan so as to make these institutions proper places for the care of the wards of the city”. Among the Federation agencies whose buildings benefited from this WPA project were longtime Federation agencies Beth Israel Hospital, the Hebrew Orphan Asylum of NYC (near City College on 138th Street), and the Central Jewish Institute at 125 E. 85th Street. This small group of files serves as a wonderful snapshot into the work of the Executive Vice-President of Federation during these 5 years just prior to WWII. For more information about Dr. Lowenstein’s career just prior to joining Federation, please refer to the American Jewish Historical Society’s collection of Hebrew Orphan Asylum records, I-42; Dr. Lowenstein was Superintendent of the Hebrew Orphan Asylum from 1905 to 1920. The capital ‘D’ dinner was the Annual Dinner of the New York and Brooklyn Federations of Jewish Charities. 1939 was several years before the two federations merged to become the Federation of Jewish Philanthropies of New York and the two federations were conducting a joint campaign and annual dinner. 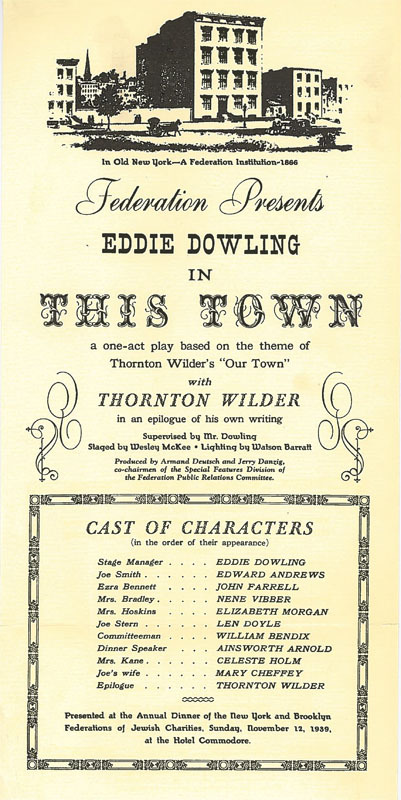 The play referenced in the minutes was an adaption of Thornton Wilder’s Pulitzer Prize winning “Our Town.” “This Town” was a one-act play, written by Armand Deutsch, Jerry Danzig, and Eliot E. Cohen, created for and produced by the New York and Brooklyn Federations. The star-studded performance of the play “This Town” at the Annual Dinner featured Eddie Dowling as the Stage Manager and Celeste Holm as Mrs. Kane.